From the perspective of its managers, a clinic has a clear boundary defined by its physical location, the layout of its premises and its relationships to its suppliers – the ‘classical’ view of an organisation with which the concept of ‘boundary’ (or ‘perimeter’) is associated. But from the perspective of its clinicians it is not clear that the clinic has boundaries – or rather the boundary is different for each patient, i.e. is experienced as an edge. This reflects the fact that the clinician, in order to address the needs of any one patient’s condition, must organise a complex collaboration with other clinicians, various healthcare providers, members of the patient’s family and quite possibly research into latest treatments and clinical trials. This is the East-West orientation of the clinician that must be balanced with the North-South concerns of resource administration, leading to the challenges within healthcare of managing East-West dominance). ‘Working without boundaries’ refers therefore to the breakdown of the ‘classical’ view of the organisation as a single entity with a set of relationships to its environment that can be characterised globally; to be replaced with working within an ecosystem across multiple edges, each with its particular multi-sided demands. Below I apply the quantum metaphor to the clinic’s situation, outline its analytical consequences for modeling value, and consider the implications of working without boundaries for the notions of strategy ceiling and architecture. Within the tempo at which the clinic works with its patients’ conditions, it is as if the clinic shape-shifts as it takes up a relation to each patient, the agility of the clinic itself being characterised by the ‘superposition’ of the full variety of possible states it can occupy within its healthcare ecosystem., The experience of this ‘shape-shifting’ is the ‘working without boundaries’ that is characterised by the Quantum Metaphor. Taking up a particular state represents a ‘collapse’ of the clinic’s superposition of possible states, the difference between the ‘classical’ and ‘quantum’ views being whether this collapse appears to establish a decoherence that is global across time periods, or is just a dynamic consequence of its interactions with a particular local environment. So what is meant here by ‘collapse’? My PhD on modeling value within ecosystems put forward a ‘triply articulated’ method of conceptual modelling. Two of these articulations were to represent the many possible composite states that could be taken up by the relationships between the different organisational entities within an ecosystem. This was a double articulation of the relationships possible between social constraints and technical behaviours, revealing the extent to which their states at any one time were under-determined (i.e. superposed). Looked at in this way, the clinic and those with whom it collaborated were like a huge box of lego bricks, including half-disassembled structures and special shapes. Each time the clinician encountered a patient, the clinician had to construct a model of patient, clinic and collaboration that could structure the patient’s care in a way that created indirect value for the patient i.e. value within the larger multi-sided context of the patient’s life. This structure-determining role of the clinician was what generated the ‘collapse’ of the ‘superposed’ states. The relation it established to what-was-valued was the third articulation of value representing the ways in which value was experienced by particular stakeholders – in this case the patient. What is meant by ‘collapse’, then, is the particular articulation of value ascribed to a given stakeholder defined as a ‘coherence frame’ local to the patient-clinic relationship. 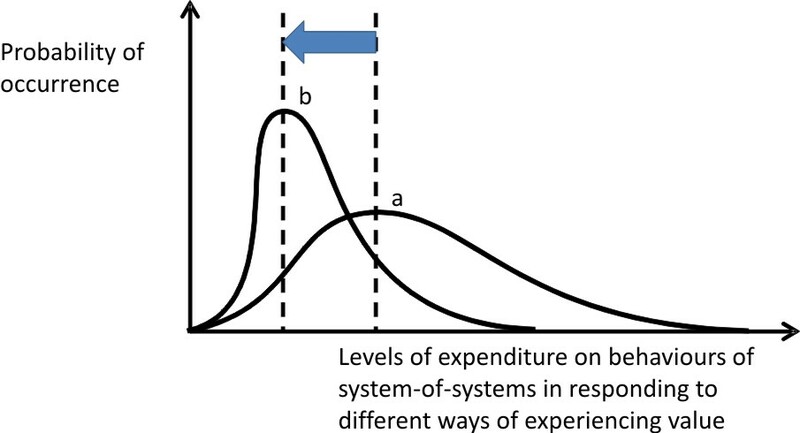 If an investment is made changing the ways a system of systems may be entangled, its potential impact may be to alter this distribution (for example in curve ‘b’ above). The return on this investment will then be the change in the range of potential expenditures. 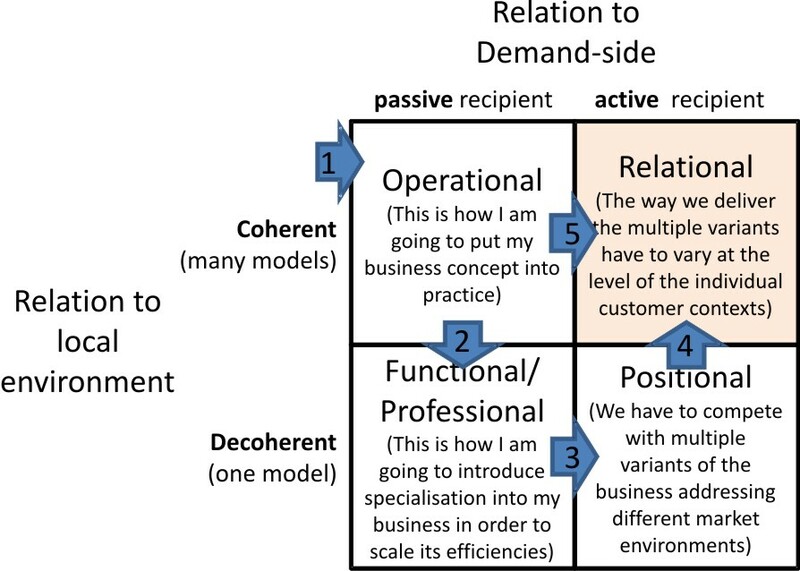 The entrepreneur sees an opportunity in the local environment amongst multi-sided demands, but has to start with a particular business model (1) e.g. starting a clinical practice. As this business grows, one possibility is to capture economies of scale through specialisation by taking up a one-sided relation to demand (2) e.g specialising in a particular kind of treatment. If successful, this model in turn can be adapted to different markets delivering economies of scope (3) e.g. providing several different kinds of treatment, each addressing a different market niche. The crunch comes when, in order to stay competitive, it has to vary how it aligns services to demand, depending on the particular context in which the demand arises, in order to deliver economies of alignment – a ‘crunch’, because this involves moving from a ‘classical’ to a ‘quantum’ understanding of its organisation (4) e.g. becoming accountable for the long-term outcome of particular patients’ treatments. The other possibility, of course, is that the practice avoids going after pursuing scalable efficiencies (the 2-3-4 route), instead going directly for scalable learning (5) e.g developing an approach to patients’ treatment based on the through-life outcomes from their condition. The point of the quantum metaphor in understanding what makes the relational approach different is this convergence of the need for economies of alignment with the ability to scale learning. Both are needed to compete in this environment in which the classical notion of ‘boundary’ no longer applies, their relationship being dependent on a quantum understanding of organisation and value. State: The state of a system of systems from the perspective of its environment is a geometry-of-use – a particular composite pattern of interoperation between its constituent systems. Superposition: borrowing from the definition of a quantum superposition – superposition holds that a system-of-systems exists partly in all its particular, theoretically possible states simultaneously; but, when measured within any given coherence frame, it gives a result corresponding to only one of the possible configurations. Collapse: A system-of-systems initially in a superposition of several different possible states appears to reduce to a single one of those states after interaction with a particular environment, the observer being a particular form of environment. The nature of the collapse depends on the particular nature of the observer’s or environment’s entanglement with the system-of-systems. Decoherence: coherence refers to the relatedness of a system-of-systems to its environment, decoherence being the loss of this relatedness. Global versus Local Environment: There are many ways in which a system-of-systems may be entangled with its environment. To the extent that the its state collapses differently when observed in different environments, the system-of-systems may be said to be entangled with different local environments. It does not follow from knowledge of this entanglement/collapse in different local environments that the global state of the system-of-systems may be known. To be over-determined means that the technology itself imposes a ‘collapse’ – the potential for the superposition of potential states in a system of systems is thus bound up with the way software is used – a point made in from race against machine to race with the machine. This structure-determining role refers to the way the clinician brings about the collapse of superposed states in the system-of-system’s relationship to the local environment that is the patient’s condition within the context of the patient’s life. Structure-determining roles are circular in nature (‘triadic’ in terms of Peircian logic), the dynamics of the situation determining the state of the system-of-system’s relation to it through the mediating effects of the observer-clinician. These are modeled as c-type, K-type and P-type relations. Global versus Local Coherence Frame: A coherence frame is the frame of reference within which the relatedness of a system-of-systems to its environment may be observed. Whether or not the coherence frame is global with respect to a system-of-systems depends on how local observations correlate with each other. This analysis examines the total cost of aligning behaviours to a variety of different multi-sided demands at a given tempo (for example, the total cost of interdicting fleeting targets in a military theater, or the total costs of responding to citizens’ queries within changing domains of interest). In the cases where this analysis has been done (detailed in evaluating platform architectures) savings of the order of 30% to 50% have been identified by investing in increasing agility within a given ecosystem. See footnote  in ‘when should critical realists care about drive functioning‘.This emergence is weak emergence, being a side-effect of trying to explain the local interactions within a ‘classical’ frame of reference. This is described in leadership terms in tempo, entanglement and East-West dominance. ‘Scalable learning‘ is a characteristic of the ‘pull’ economy, written about by John Hagel and John Seely Brown in The Power of Pull. If delivering economies of alignment becomes possible with agile infrastructures, scalable learning becomes necessary for those at the edges to make effective use of the infrastructures. To understand scalable learning we have to engage with triple-loop learning and the economy of leadership within which such learning can take place.